Nissan will introduce the ESFLOW concept, an electric sports car, at the Geneva Auto Show, choosing to skip this week's Chicago Auto Show. Nissan says its ESFLOW concept is "different than every other sports car yet built: it's electric," which just might be news to Tesla, which has been making an electric sport car with acceleration from 0-60 in under three seconds. The ESFLOW concept is a rear-wheel drive two-seater with two electric motors, each driving a rear wheel. Its laminated lithium-ion batteries help deliver an estimated 0-60 time of less than 5 seconds. It's fast but not Tesla fast. 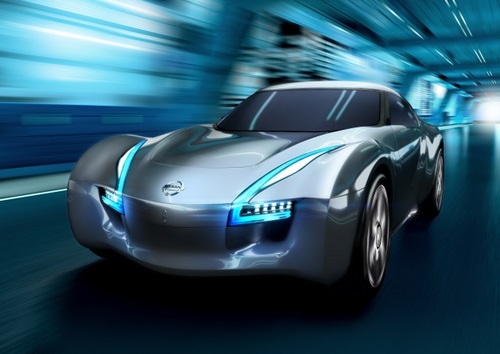 Nissan also says it can go 150 miles on one charge. The ESFLOW is being built off the Nissan Leaf, a vehicle that Nissan is having trouble producing in sufficient numbers to meet consumer demand. ESFLOW is not an existing ICE (internal combustion engine) powered vehicle that has been adapted to run on electricity, but a sports car that's been designed from the outset as a Zero Emission vehicle. Power for the motors comes from the same laminated lithium-ion battery packs used in the Nissan Leaf, but in ESFLOW the packs are located along the axis of the front and rear wheels. This centralizes the mass of the car, and thus its rotation point, close to the driver's hips, which helps fuel efficiency. The economy in the fuel department unfortunately does appear to apply to taste when it comes to interior design. The seats are upholstered in gold leather and perforated gold suede while the doors are trimmed in dark blue leather and suede. The blue and gold motif is continued across the dashboard, which is also adorned with silver carbon trim, and features four multifunction illuminated LCD displays. The ESFLOW concept will be unveiled at the 2011 Geneva Motor Show (March 3-13).